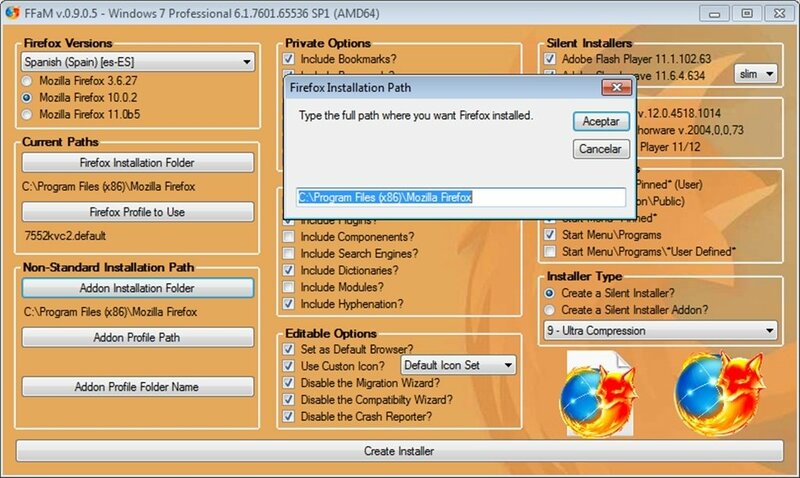 FFaM is a portable program with which you will be able to easily create a Firefox installer with the features which you choose. If you are using various computers, it will come in very handy to be able to create an installer for the Firefox browser with the bookmarks, the extensions that you use or your history file. This is also possible thanks to Firefox Addon Maker. FFaM shows a single window in which you will have to select the features that your copy of Firefox is going to include: the language, the version, if you want to include the bookmarks, the passwords or the Firefox history that you normally use. What's more, FFaM creates a silent installer, in other word, when you install the customized browser it will take place automatically without requiring any interaction from the user. Firefox Addon Maker allows to include in the installer the last version of Adobe Flash Player and Adobe Shockwave. You can also choose the icon used by Firefox. Include extensions, themes, complements, dictionaries, search engines or modules. When it creates the installer, it automatically downloads the latest version of Firefox and all the necessary elements. This download requires a 7z compatible compressor.